Kaminsky: "A ferry route along the South Shore will create options for commuters when the next crisis regarding the LIRR inevitably arrives." 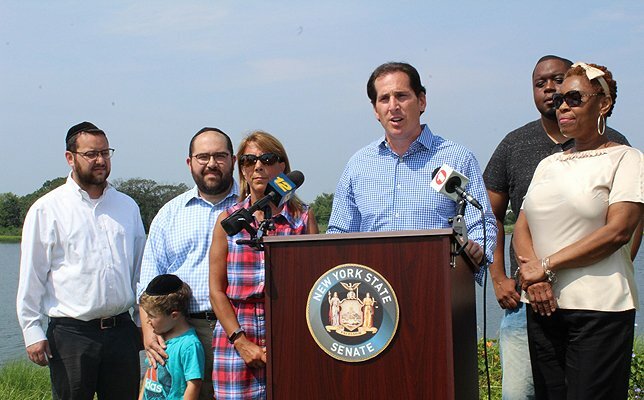 (L to R): Reuven Levine, Adam Mayer and son Kufi, Assemblywoman Melissa "Missy" Miller, Senator Todd Kaminsky, Jeffrey Louis and Yolette Louis. Inwood, NY - July 24, 2017 - Senator Todd Kaminsky and Assemblywoman Melissa “Missy” Miller today called for the Metropolitan Transportation Authority to explore the establishment of a ferry route to Manhattan originating along the South Shore of Nassau County. Senator Kaminsky and Assemblywoman Miller sent a letter to Joseph Lhota, Chairman of the Metropolitan Transportation Authority (“MTA”), requesting that he join them for a tour of potential docking sites near Inwood, or other suitable locations, on the South Shore of Nassau County. “A ferry route along the South Shore will create options for commuters when the next crisis regarding the LIRR inevitably arrives. Regardless of the success of this summer’s planned repairs, the long-term economic viability of Long Island depends on improving and diversifying our mass-transit system. It is not enough to simply say, “We made it through the Summer of Hell,” and then act surprised when a “Winter of Hell” immediately follows, and we are not prepared. A ferry route would be a key, new way to get passengers off of our roads, and out of Penn Station,” said Senator Todd Kaminsky. “Solving our ongoing transportation problems is going to require new ideas and fresh solutions. Long Island commuters deserve relief from train cancellations and delays. Unreliable public transit has led to congestion and gridlock on our roadways as residents become wary of taking the train and choose to drive. A ferry from our community to Manhattan would alleviate these issues and provide residents with a safe, reliable commute. Revitalizing and expanding our transit system with a ferry route along the South Shore is a wise investment in our future and helps address a serious ongoing problem we’re facing right now,” said Assemblywoman Missy Miller. “As a commuter that takes the Inwood LIRR, I would be delighted to have a different option to get to and from Manhattan. Right now, when something goes wrong, there are no options for me. A ferry will be a great addition to the Inwood community,” said Yolette Louis, a resident and commuter from Inwood. “The possibility of a ferry in Inwood would give another, more reliable mass transit option with direct access to Manhattan and vice versa. It can open up new economic opportunity here and the prospect is very exciting. Thank you Senator Kaminsky and Assemblywoman Miller for spearheading this effort,” said Adam Mayer, a resident of Inwood who utilizes the LIRR. The Senator and Assemblywoman’s call for a South Shore ferry comes amid summer-long repairs at Penn Station and looming repairs, yet to begin, in the East River tunnels. Subject: LongIsland.com - Your Name sent you Article details of "Senator Kaminsky, Assemblywoman Miller Call For MTA To Explore South Shore Ferry Route"